Everyone wants to have "green buildings" that are good for the environment, community, occupants, and owner. But most organizations have a wide range of existing building vintages, limited funding, and the effort to green-up their facilities can be daunting. 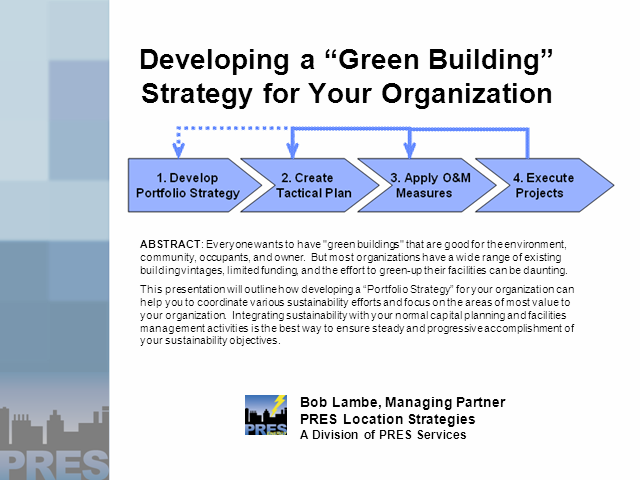 This presentation will outline how you can develop a “Location Strategy” for your organization that helps you to coordinate various sustainability efforts and focus on the areas of most value to your organization. Integrating sustainability with your normal capital planning and facilities management activities is the best way to ensure steady and progressive accomplishment of your sustainability objectives.